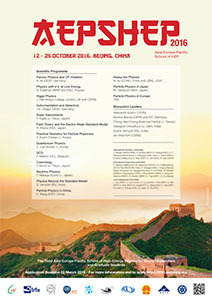 AEPSHEP (Asia-Europe-Pacific School of High-Energy Physics) is a series of Schools held in the Asia-Pacific region every two years, in even-numbered years. It caters to students at a similar level to the annual CERN-JINR European School of High-Energy physics, and the CERN Latin-American School of High-Energy Physics (held every two years, in odd-numbered years). AEPSHEP is built upon the experience from these Schools as well as from the successful France-Asia Particle-Physics School. The purpose of the School is to provide young physicists with an opportunity to learn about recent advances in elementary-particle physics from world-leading researchers. It also aims to encourage communications among Asian, European and Pacific-region young researchers. The School provides High-Energy Physics courses from an experimental and phenomenological perspective, with a focus on accelerator-based programmes in Asia and Europe, and other related fields such as astro-particle physics and cosmological aspects of particle physics. The programme of the School is at a level appropriate for PhD students in the field of experimental particle physics. Students working on phenomenology (if not too far from particle-physics experiment) may also be accepted. The School is open to junior post-docs (typically less than two years after completing their PhD), and also to advanced MSc students provided that their prior knowledge is comparable with that of the principal target audience so that they can benefit from the courses offered at the School. Up to 100 students are expected to attend each School. The international organisers of the School include representatives from Australia, CERN, China, DESY, France, India, Japan, Korea, Pakistan, Russia and Taiwan. The local organisation of the 2016 School is being supported strongly by IHEP and UCAS, with the involvement of other institutes in China. Applications to attend the School are invited particularly from students from countries in the Asia-Pacific region and from Europe, although applications from other regions will also be considered.